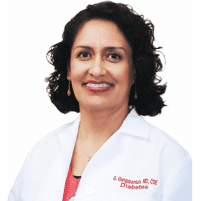 As a skilled physician specializing in obesity treatment, Dr. Gopika Gangupantula is available to work with you to achieve weight loss. She promotes a steady, healthy weight loss regime using nutrition therapy and the customized treatment each patient needs. Start your weight loss journey at Valley Diabetes & Obesity in Modesto, California for healthy results. What does a personalized medical weight loss program involve? If you have struggled in the past on your journey to weight loss and are looking for a partner in health, give us a call today! Why do people want (or need) to lose weight? Weight loss is a necessary measure for those with morbid obesity, creating a rising demand for weight-loss treatment. People living with obesity are at significant risk for not only a lower quality of life but for a shortened lifespan. Consult with Dr. Gangupantula to see how you can get your health back on track. Obesity results from an excess accumulation of fat that exceeds the body’s skeletal and physical standards. It’s labeled as a disease as it produces a grave cause for health concerns and even a threat to life. Morbid obesity denotes a higher Body Mass Index (40 and above) than obesity and generates a more severe risk for comorbidities and debilitations, including physical disabilities and death. Nutrition therapy is designed for people who are overweight. It involves gradual and steady weight loss through a diet plan rather than instant results that can be dangerous for your body. Dr. Gangupantula is trained extensively to design a customized nutrition plan for you by examining your eating habits and setting new, realistic weight loss goals based on daily caloric intake. How will nutrition therapy help me? Even if you recognize your need to lose weight, you may not know how to go about it safely. Each patient requires a particular diet to achieve his or her best health. The benefit of nutrition therapy is that the weight loss plan isn’t a generic one; the steps and goals involved in your plan are customized to your personal needs and designed to make lasting health improvements. Medical nutrition therapy has the potential to eliminate many conditions and issues that are threatening your health. Are there risks involved in nutrition therapy for weight loss? There are virtually no risks involved in medical nutrition therapy. If you work in close collaboration with Dr. Gangupantula to follow your personalized plan, you’ll notice a gradual change that doesn’t involve bodily risks associated with rapid weight loss.